The Life skill program has changed lives of so many children who come from vulnerable community at Vyasarpadi. Many of them used to be aggressive, disrespectful, disobedient and would fall into bad company. Life skill training programmes builds values in life of children. As trainers we become friends of the children and they confide in us a lot of their feelings and yearnings. We take these in a very positive way to their parents in our programme Home Visits, where they listen to us often with surprise and tear sand lend full cooperation to their kids. They change their attitude towards their children and life becomes a lovely for both. Family values and bonding strengthen, laying the foundation for a healthy society. These children turn from idle children to ideal children. We are proud to see these kids gain their self esteem and confidence. Parent-child relationships have improved, the stress on the children is relieved and they are able to show emotions and empathy and a positive behavior change is seen. My daughter Manjula is an intelligent child but she used to be very shy. Always a loner and an introvert, she never spoke to others. She would go to school and come back home, never mingle with friends, always staying at home. She feared talking to people. One day a teacher from BSAC visited us. She told us about Children Sangam and asked Manjula to join. I thought this might help Manjula overcome her shyness and would be a platform to meet people. I encouraged her to join the Sangam. Though initially very reluctant, she started attending the monthly meetings twice a month. This Sangam taught her child rights and helped her participate in a lot of social activities which groomed her into a responsible citizen. This Sangam was a turning point in our lives. I could see my child blossom into a confident, fearless yet modest child. She became an outstanding student in all aspects. 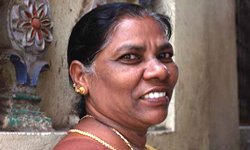 She convenes Sangam meetings, and she participates in meeting on issues of the community. She has excelled in extra circular activities like dance, drama and public speaking. She would shares her knowledge with other kids and teach lessons, dance and drama at school to other children. At school and community events she faces VIP guests with great confidence and humility. She has no stage fright, she is loved by all. She went on a trip to Dindugal and led a group of Sangam children; I was amazed at the leadership quality she displayed. Into her first year in college, she MCs at meetings, gives welcome speeches and is already well known She is now a dream child every mother would love to have. It is a great feeling to see your children do well in life. This gives us parents great relief and the assurance that they will have the best future and they will mange life well, even after we are gone. My family and I owe this grooming of my child to BSAC. My son Satis, doing first year Maths, also benefitted from Children's Sangam. 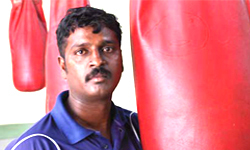 M.Senthil is proud to have trained international boxers in ten years as a boxing coach. His trainees have netted jobs with the armed forces, Railways and Police. Employed with the Sports Development Authority, he had a 3-month coaching course for fitness in Hungary.He was fortunate to have undergone a yearlong coaching course at NIS, Calcutta. Having won a bronze at the inter University Nationals in boxing, Senthil was clear what he wanted to do in his life. So he qualified himself with a BPEd from YMCA. Life was not always so clear and orderly for Senthil. As the fourth of six children in a Vyasarpadi family, Senthil found his way to BSAC, where is joined Scouting. Scout Master K Anbukarasan, who was also a boxing coach, suggested he took up boxing, which he did. “That was for self defence. Such was the area”, reminisces this soft-spoken man of measured words. Senthil lost his father when he was doing his 12th. 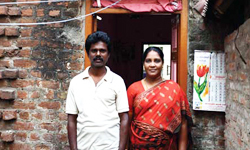 But his mother, a sweeper with Chennai Corporation, made sure he could continue his studies. “I can’t ever forget BSAC and the Scout Master. BSAC even paid my fee of 1,000 rupees, for Scout master training. That was a lot of money then. That qualification proved so important in my career growth”, recalls Senthil. Naseem Banu Kala lost her husband when she was carrying their first child, whom she named Shakeel Ahamed. Life has not been easy but she is happy that Shakeel is growing up well. 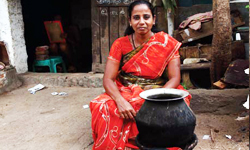 Naseem Banu runs a tiffin shop outside her shack, from 6 in the evening. Shakeel was an average child and needed grooming and guidance. When he was a Standard 6th student, he joined BSAC supplementary centre in 2008. Soon he became confident and more responsible. He took active part in sports activity and won many prizes and medals. He improved in his studies too. He learned to mange time well and to take up responsibility. He participates in all extracurricular activates and community events. He dances well, is keen on Carrom; he acts in plays at school. In his 10th Standard now, he comes fourth or fifth in his class. Life was not always so clear and orderly for Senthil. As the fourth of six children in a Vyasarpadi family, Senthil found his way to BSAC, where is joined Scouting. Scout Master K Anbukarasan, who was also a boxing coach, suggested he took up boxing, which he did. “That was for self defence. Such was the area”,reminisces this soft-spoken man of measured words. Senthil lost his father when he was doing his 12th. All of us want our children to be better settled in life and achieve the best. It would be a great joy to see their success. We did not have much education orproper exposure in our lives and we struggle for livelihood. It is great to see our children getting educated and faring well thanks to the guidance of BSAC. This achievement of my son is like a dream come true. He has been shown the right way at the right time. Support by BSAC supplementary centre to my son and his achievements are the best gift of my life. My family is full of gratitude to BSAC for giving the best to my son. The coming generations would have better life to live.